his has been a hard year. I'm emotional. And my penchant for responding emotionally to music is at an all-time high, as evidenced by a recent sobbing fit during the Counting Crows' version of "Big Yellow Taxi" on the radio. I'm lying about the sobbing fit, but it's hard not to get choked up watching Thomas Mapfumo and all the dancing babies at the Oregon Zoo on a recent Thursday night. The swifts dive for bugs in the dusk. The mbira bubbles rhythms. 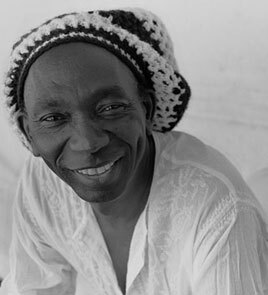 Mapfumo benignly grooves in fedora and silk bowling jacket. The Oregon Zoo has been sponsoring concerts on the green for 25 years, which is apparently some kind of record. You'll forgive me if I can't remember the exact nature of the statistic. As the kind lady who introduces Mapfumo and the Blacks Unlimited mangles his name into "Mapoofo," I lose my concentration. Mapfumo, born in 1945, was raised (like most Zimbabweans) in the rural countryside, where meditative farming activities and the traditional music of the Ngoma drums and the mbira thumb piano formed the character of his being. His musical career encompasses two main threads formed by his upbringing and the struggles of his country. The first thread is the integration of old-fashioned instruments (like the mbira) and traditional African sounds with modern instruments (electric guitar and bass) and musical styles such as reggae. The second thread leads him to sing about the struggles and hardships of his people, often with open political critique. In a country where President Robert Mugabe seemingly ignores such problems, even exacerbating them to maintain his grip on power, the music of Mapfumo is banned. Today, the "Lion of Zimbabwe" lives in self-imposed exile in Eugene, Ore.
Exile apparently hasn't hurt his band's ability to create spellbinding, toe-tapping music. The polyrhythmic interplay between the traditional instruments and the modern ones creates songs that exist on a singular plane, coursing along in circular fashion. The songs spill from the slowly boiling witch's cauldron of the Blacks Unlimited, creating tapestries of buzzing, sweet melodies that move in loops, generating power while never really ending. The drums keep it funky, but it's all on the wheel as patterns of different lengths harmonically pass each other by, waving every now and then. The songs beg not to end. Mapfumo improbably chants singsong plaints of the suffering of his people on a beautiful night in a place where we don't even know how good we've got it. And the babies dance. There is one dancing baby or spazzing toddler here for every four people, because the almost childlike, shimmering melodies and bouncing beats are tot-nip for the little ones. 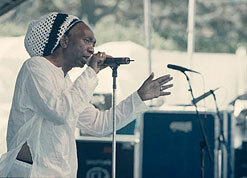 Parents: don't miss Mapfumo next time he plays the zoo. Adult hippies and dreadlocked admirers (Mapfumo seems to have lost his locks ...) catch a break, too, when the band comes back for a second set  something I don't remember from my youthful Jazz at the Zoo days. This second set is for the faithful as  to my undereducated ears  songs that may be newer or at least more experimental are played. Mapfumo has a relatively huge backlog of material, so I could be wrong. But the band perks up for these tunes, betraying freshness and exuberant enjoyment. The songs distinguish themselves from their predecessors by incorporating  gasp  more than one distinguishable part. Is that a verse/chorus structure I hear? No, but it's a different part, and it moves on to a different part after that. The diving swifts seem to notice Mapfumo's costume change, a showman in the land of the free, singing about a place where a government beset by the problems of hunger, poverty and an AIDS epidemic has at times limited access to food, education and health care. 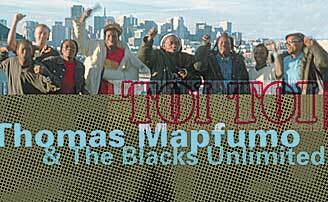 Thomas Mapfumo & The Blacks Unlimited: the band betrays freshness and exuberant enjoyment. And it's starting to happen here. Mapfumo, in a silk jacket under lowering skies, reminds us how important it is for a freely educated people to maintain control of their own government, and not the other way around. The animals try to sleep, the babies dance, and Mapfumo fulfills his role as the Lion of Zimbabwe.